Brazilian model and actress Caroline Correa. It seems that fashion and food do meet from time to time. 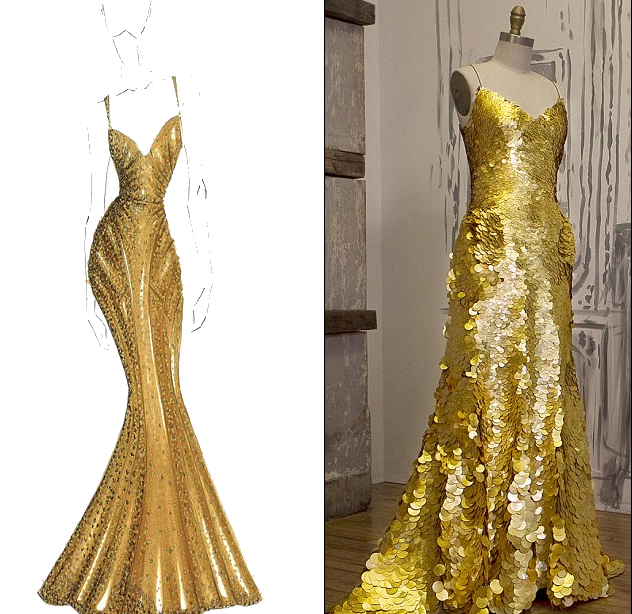 In this case, a new golden ice cream bar inspired “Project Runway” judge Zac Posen to create an elaborate 24K gold dress valued at $1.5 million. To introduce its Magnum Gold bars in the U.S., Unilever has partnered with the American designer who came up with a couture gown made of 10,000 hand-embroidered 24K gold sequins. Brazilian model and actress Caroline Correa will be the first one to wear the golden dress, which was inspired by melting ice cream, reports TV3. It will be seen when she walks down a gold carpet Magnum has arranged during the Tribeca Film Festival on April 18. Magnum Gold bars TV spots are set to air during the MTV Movie Awards telecast on April 14. The bars, which Correa will probably stay away from if she wants to fit in the expensive dress, are made of vanilla-bean ice cream with a swirl of sea-salt caramel and a gold-coloured Belgian chocolate shell.